I recently bought a 1p celeriac on one of my bargain shops and put out a call on Facebook to see what ideas I could glean from my readers. I couldn’t remember the last time I’d bought a celeriac so along with ideas for things like Remoulade the one that jumped out at me was roasting. That then lead to the idea for a soup and I just thought garlic and lemon would be perfect bed fellows too. 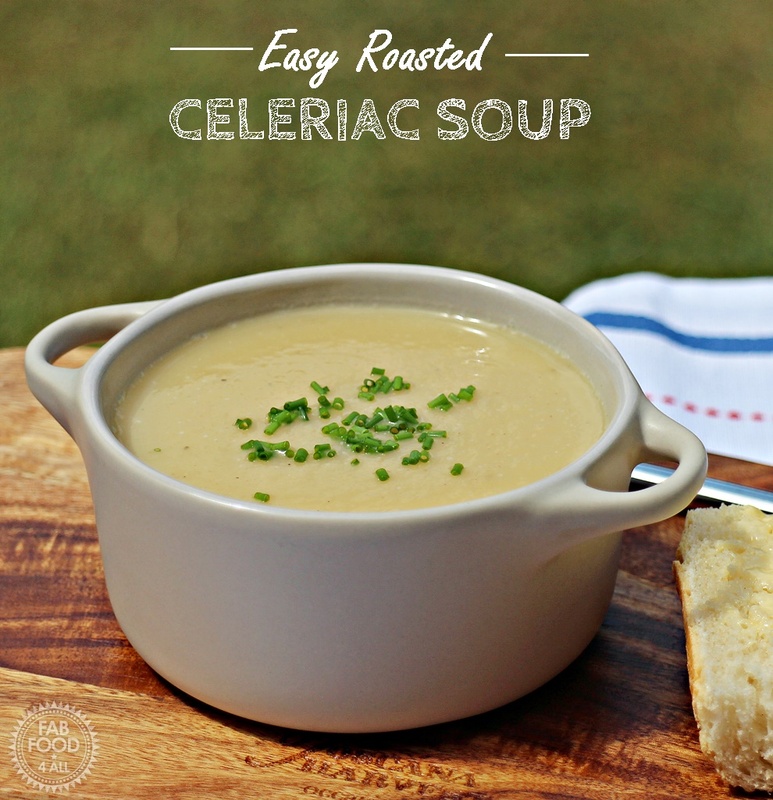 So my Easy Roasted Celeriac Soup was born and it really is just so simple and quick to prepare. My husband wasn’t sure if he’d like celeriac but after trying it he proclaimed it to be delicious as did my son. Roasting really brings out the sweet caramel flavours of the garlic and celeriac and the lemon adds a lovely contrasting zing. 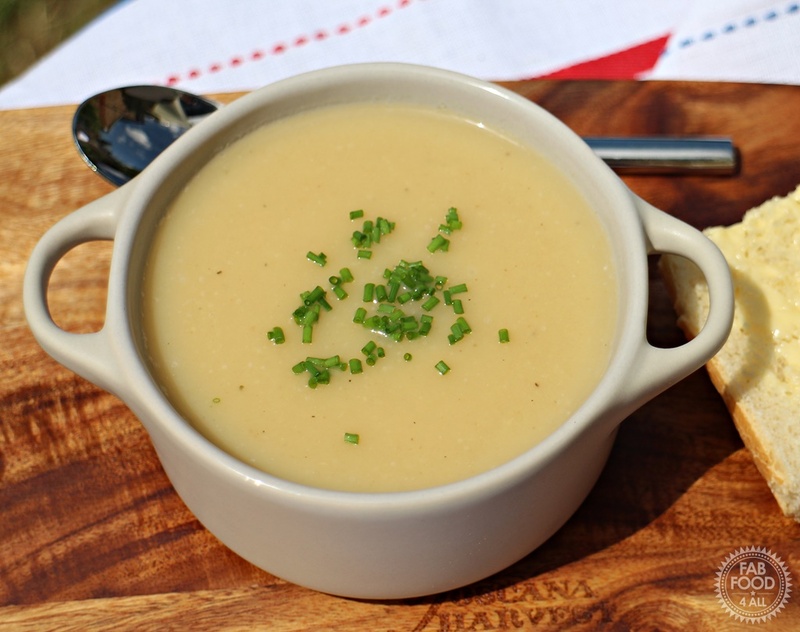 Celeriac is still in season right now so do give this delicious soup a go! I’d still love to hear what you do with your celeriac so do tell me in the comments below! As this soup was made so frugally I’m entering it into Credit Crunch Munch which I run with Fuss Free Flavours and is this month hosted by Food Glorious Food. 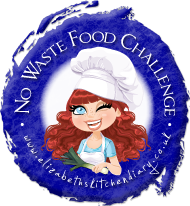 I’m also entering it into Simple and in Season run by Ren Behan as well as No Waste Food Challenge over at Elizabeth’s Kitchen Diary. Last but by no means least I’m entering No Croutons Required run by Tinned Tomatoes! 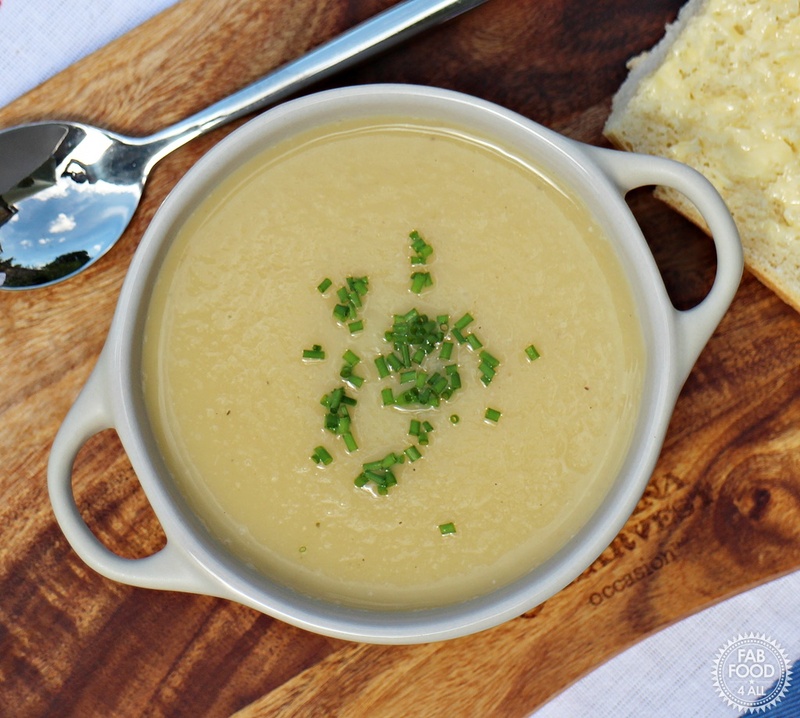 A delicious and simple roasted celeriac and garlic soup with a zing of lemon! Put the celeriac and olive oil in a bowl to combine. Spread the celeriac out on a baking tray, add the whole garlic bulb and season with salt and pepper. Place in the oven and roast for 45 minutes (turning the celeriac a couple of times). Remove the garlic bulb and allow to cool. Carry on roasting the celeriac for another 10 minutes or until golden. Once the garlic has cooled, slice the top off and squeeze the garlic out of its skin into a large pan. Add the roasted celeriac, stock and lemon juice then blend (I use a stick blender). Heat through, adjust seasoning if necessary and serve with a sprinkling of chopped chives. I am thinking of making this soup, but I am on a diet. Any idea of the calorie count? It sounds lovely. I use spray oil BTW. Hi Vivian, I’m afraid not but I’m sure there are online calories counters if you Google. My girlfriend says this soup is better than any soup she has had before. Even in fine dining places. I get an organic veg box and, at this time of year often get celeriac…. 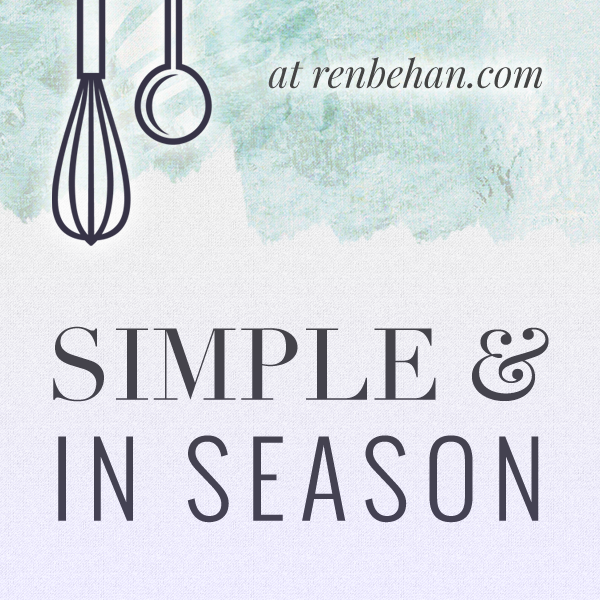 at which point I groan as haven’t found many recipes I like. This soup is amazing. It gets over the all consuming celery taste and adds another dimension. I added lemon zest as well as juice. Thanks!